What is a honey bee swarm? Honey bee swarms are a favorite topic of people who make horror movies. Actually, they are one of the most beautiful and interesting phenomena in nature. A swarm starting to issue is a thrilling sight. A swarm may contain from 1,500 to 30,000 bees including, workers, drones, and a queen. Swarming is an instinctive part of the annual life cycle of a honey bee colony. It provides a mechanism for the colony to reproduce itself. What makes a honey bee colony swarm? Overcrowding and congestion in the nest are factors which predispose colonies to swarm. The presence of an old queen and a mild winter also contribute to the development of the swarming impulse. Swarming can be controlled by a skilled beekeeper; however, not all colonies live in hives and have a human caretaker. When do honey bees swarm? The tendency to swarm is usually greatest when bees increase their population rapidly in late spring and early summer. In Colorado, this would be in May and June. 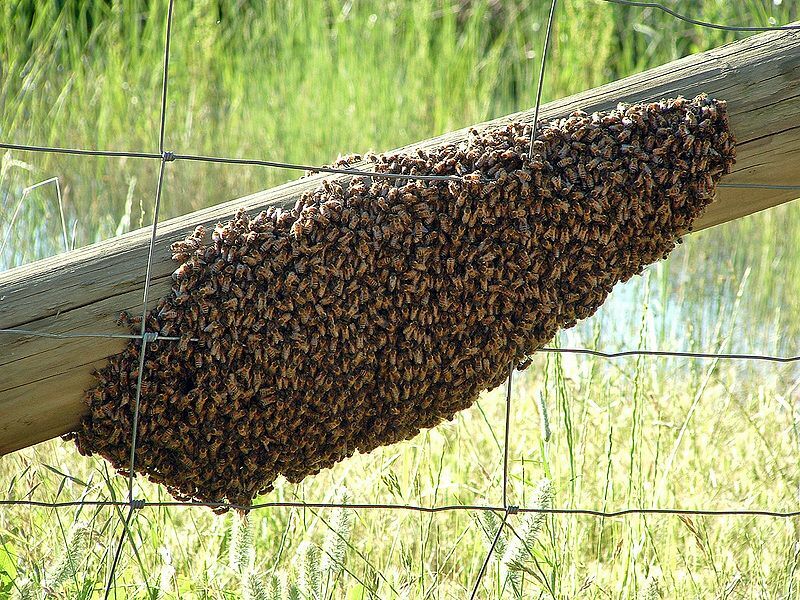 Are honey bee swarms dangerous? No - honey bees exhibit defensive behavior only in the vicinity of their nest. Defensive behavior is needed to protect their young and food supply. A honey bee swarm has neither young nor food stores and will not exhibit defensive behavior unless unduly provoked.